White satin one-piece dress, silk-screen printed by Roy LICHTEMSTEIN. Dotted in red all over and the rising sun and clouds on the back. Front and left side opening. Ivory silk satin coat with left side front opening by buttons. Roy Lichtenstein (1923-1997) was one of the key figures from the early days of pop art. 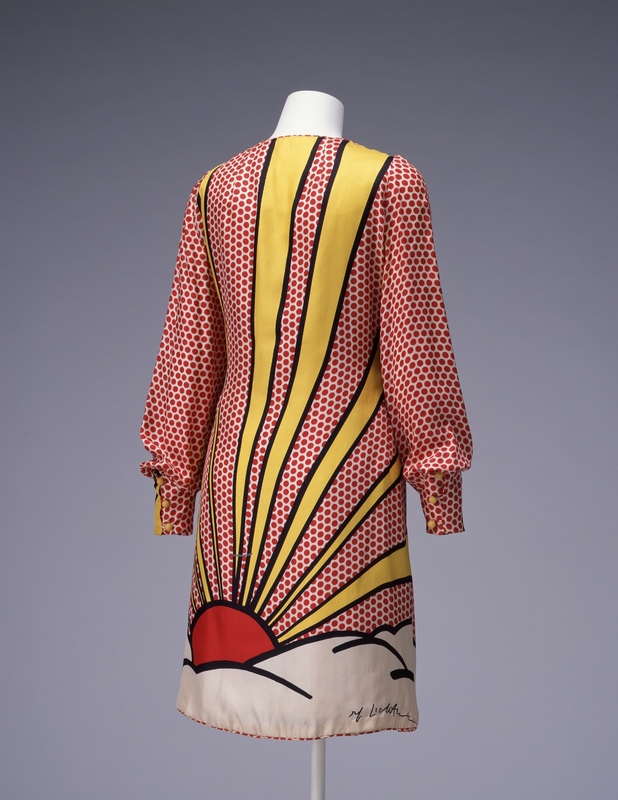 His Sunrise (1965) is printed boldly onto the textile that became the back of this dress. In contrast, the accompanying coat is a plain ivory color with no patterning. The outfit caused a stir when worn by Lichtenstein's friend, Letty Lou Eisenhauer, to the opening for the artist's 1965 exhibition at the Galerie Ileana Sonnabend in Paris. Incorporating Lichtenstein's trademark Benday dots and his signature, this was a wearable work of art created at a time when Lichtenstein was the darling of the art world. The dress was effectively a painting, and the coat was simply the white cover that concealed the painting until its time to be revealed, provided only for dramatic effect. In the 1960s art and life approached much closer to each other than ever before. Lichtenstein, Andy Warhol, and other young artists adopted fashion as one of their media, conveying the fresh, exciting atmosphere of that period in a form that could walk out of the gallery and into the city.